Is there a pre-pregnancy diet plan? What is a healthy pregnancy diet plan? What foods are part of a pregnancy diet menu plan? Is it OK to diet during pregnancy? Are supplements, herbs, and over-the-counter (OTC) medications safe to take during pregnancy? What foods and exercise help morning sickness and heartburn symptoms? What about a post pregnancy diet? What foods, drinks, or medicatons should be avoided during pregnancy? A healthy diet during pregnancy ensures optimal health for both the mother and fetus. Women need only 300 extra calories per day during pregnancy. A healthy pregnancy diet should focus on unprocessed foods that come mostly from plant-sources. A healthy pregnancy diet also can include some animal products. The diet during pregnancy should include extra calcium, iron, folate, zinc, iodine, and vitamin D.
topped with about 2 tablespoons of healthy fats like olive oil. Women who are planning in advance to become pregnant have a great opportunity to focus on a healthy diet and get into optimum health before conceiving. Many women are encouraged to consider the 3 months before conception as a "pre-mester" or a trimester of pregnancy before conception. Not only does following healthy pregnancy diet plan guideline help a woman get into optimal health, it may help her conceive more easily. The father-to-be also is encouraged to follow a pre-pregnancy diet because it may help the mother-to-be stick to a healthy pregnancy eating plan. Myths of pregnancy such as 'you need to eat twice as much because you're eating for two' or that indulging your cravings will give your baby birthmarks are outdated and inaccurate. From a scientific perspective, there are increased nutrient demands during pregnancy, but the wisdom of the body also tells us pregnancy is a time to focus on nourishment. It is a time for the mother-to-be to focus on being as healthy as she can because that care will translate to her baby in utero. Also, establishing healthy habits now will set a positive example that will benefit the child over his or her lifetime. The increased caloric needs during pregnancy are minimal; about 300 extra calories are needed each day. This is equivalent to three-quarters of a blueberry muffin or 2 apples or 2 ounces of chocolate milk. There also are a number of micronutrients or vitamins that are needed in increased amounts. The increased requirements are not solely due to the growth of the fetus. The changes in the mother's metabolism also contribute to the increased nutritional needs. The goal of healthy eating during pregnancy is to maximize micronutrient density. In other worlds, make sure you are getting maximum nutrition out of every bite, and that you avoid "empty" calories. It's also important to know what foods, drinks, medications, and other toxins to avoid, for example, foods that have a higher risk of food-borne illness and foods that are toxic to a developing fetus such as alcohol, mercury-containing fish, and trans fats1. For many women, taking a prenatal multivitamin can be "insurance" against days when they aren't able to eat much (for example, to make up for lack of nutrition due to morning sickness, or not sticking to a healthy diet one day); however, it is important to remember that supplements supplement the diet; they aren't replacements for healthy eating. A well-balanced, micronutrient dense diet is the key to a healthy pregnancy. Ideally, women should start eating this way before conception, but making healthier choices at any time will always help. healthy fats such as olive oil, avocados, and the fats that occur in nuts, seeds, and fish. In general, women will get high levels of these nutrients by choosing a diverse, colorful diet that focuses primarily (but not entirely) on plant-based foods. What Are Pregnancy Superfoods (Power Foods)? Pregnant women only need about 300 extra calories per day. While every woman is going to be different, research shows that for a normal weight woman (BMI 18.5 – 25), the optimal pregnancy total weight gain is about 25-35 pounds7. Larger women will gain less and smaller women gain more. All women should decrease their focus on weight and focus on the quality of their diet, ensuring good nutrition. BMI <18.5 kg/m2 (underweight) - typically gain 28 to 40 lbs. BMI 18.5 to 24.9 kg/m2 (optimal weight) - typically gain 25 to 35 lbs. BMI 25.0 to 29.9 kg/m2 (overweight) - typically gain 15 to 25 lbs. BMI ≥30.0 kg/m2 (obese) - typically gain 11 to 20 lbs. During the first and second trimesters, weight gain manifests as an increase in maternal fat stores, plus a 60% increase in blood volume. Later in pregnancy, more of the weight gain is due to the fetal growth, amniotic fluid, breast development, and placenta. Overweight women sometimes even experience weight loss during the first trimester and slowly gain a small amount over the second and third trimesters. There is no minimum amount of weight an overweight woman needs to gain as long as she is eating micronutrient dense foods and fetal growth is on track. Regardless of the weight of the woman when she becomes pregnant, it isn't a good idea to diet during pregnancy. Research from famines during World War II in Europe have taught us about the epigenetic implications of restriction during pregnancy. Epigenetics describes the impact of the prenatal environment on the genetic programming of the child that stays with them for life. 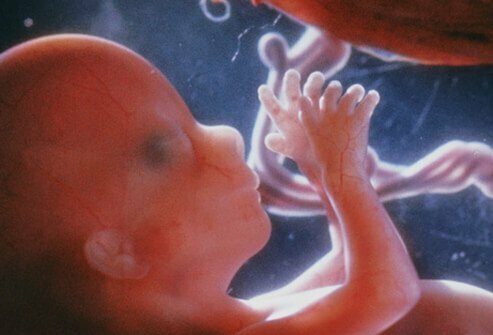 In fact, the prenatal environment has an impact on the developing ovaries and eggs in the female fetus, having an impact on the next generation too! A mother's nutritional choices during pregnancy can affect her grandchildren! During the famines in World War II, pregnant Dutch women lived on less than 900 calories a day for a winter and their metabolism became very efficient at storing energy. When the war ended and food supplies returned to normal, and the babies were born, the women and their babies had normal calorie intake. However, those babies were far more likely to go on to become obese or develop diabetes because their genes were influenced during the time of scarcity. In the same way, dieting during pregnancy can have unintentionally metabolic consequences on the genetic programming of the infant that will stay with them for life. While dieting (restricting calories) during pregnancy is discouraged, eating a healthier diet by removing extra sugar and processed foods is an excellent idea. This is the type of "diet" I put all my patients on. The focus should be on high quality nutrition, optimizing micronutrient intake, and minimizing empty calories. Low carbohydrate diets can be healthy during pregnancy, as they are for any life phase, but the devil is in the details, as they say. More precise than simply a low carb diet, glycemic load diet is beneficial during pregnancy (and throughout life). Glycemic load is a term that measures how quickly a carbohydrate is digested and turned into blood sugar. Carbohydrates with lots of fiber, or combined with fat or protein have lower glycemic loads and raise blood sugar slowly, providing steady energy and preventing a spike in blood sugar and the subsequent low blood sugar drop. How do you follow a low glycemic load diet? Dr. Brewer Pregnancy Diet is a diet plan that was popular in the 1980s. While it is a little outdated, the basics are still relevant and credible. Dr. Brewer calls for frequent snacks and pays close attention to salt, calories, and protein. The recommendations include getting daily servings from major groups of healthy foods, like calcium or iron containing foods. An omelet made with 2 hormone-free eggs, spinach, and tomato. Add about 1 tablespoon of added healthy fats such as olive oil, chopped nuts or seeds, or hormone free butter to the dish. Other important micronutrients during pregnancy are omega-3 fatty acids, DHA specifically, and probiotics. DHA is necessary for healthy development of brain and nervous system and may have beneficial effects on the cognitive development of the child. Pregnancy superfoods may be included in a holistic pregnancy diet to ensure that optimal amounts of nutrients are enjoyed from food. Pregnant women can absolutely follow vegan or vegetarian diets during pregnancy. In fact, doing so may help them avoid some of the added hormones that are common in non-organic animal products. However, there are some nutrients that are commonly deficient in vegetarian diets. Pregnant women who are vegan or vegetarian should be extra careful to ensure they are getting enough calcium, iron, and B-12. Protein intake needs to be monitored too. These last three are not part of a vegan pregnancy diet, but are appropriate for a lacto-ovo-vegetarian diet. B-12 is needed for proper DNA expression in the growing embryo and fetus. Deficiencies cause anemia and are associated with low birth weight, pre-term delivery, preeclampsia, and neural tube defects8. Pregnant women need 30mcg a day according to the Recommended Daily Allowance, and the sources are all animal-based. Vegan women may want to ensure they get enough by taking a methylcobalamin supplement. Other B vitamins, specifically folate and B6, are important in pregnancy. A good-quality prenatal multi or B complex will provide these nutrients. Protein requirements in pregnancy are increased by 50%. On average, a pregnant woman needs about 70 grams of protein per day. Protein will not only ensure good growth of the baby, it will help keep the mother's blood sugar stable and may help reduce morning sickness. Research studies have shown better birth outcomes (fewer underweight or early babies) when a mother's daily diet is at least 25% protein. Most people think of meat when they think about protein, but there are many excellent vegetarian sources. A vegan or vegetarian pregnancy diet can easily get enough protein from bean, nut, and grain sources. Additionally, relying only meat sources can increase your intake of saturated fat and other components of meat that are wise to limit in the diet. Here are some examples of good sources of healthy proteins. poor cognitive development in children. Anemia has been linked to pre-term births, low birth weight, and even autism and increased maternal mortality10. Thus, it's really important to get enough iron during pregnancy. The RDA for iron is 27mg during pregnancy; your obstetrician or midwife may recommend 40mg per day to correct a deficiency. Cooking in cast-iron skillets can also increase iron intake – you can add 5mg of additional iron for each per saucy, vitamin C-rich dish you cook in cast iron. Calcium is critical for developing bones. It also reduces the risk of pre-eclampsia and hypertension. Women who get enough calcium during pregnancy have a 35% lower risk of high blood pressure and a 55% lower risk of preeclampsia. If the mother isn't getting enough additional calcium in the diet, the fetus will still get enough, but it will come from the reserves in the mother's bones. The mother's ability to absorb calcium is greatly increased during pregnancy. This is why the RDA for calcium doesn't increase during pregnancy. However, most adult women don't get enough calcium in the first place. When we think about calcium, most people think about milk, but there are numerous non-dairy sources of calcium. Women who are lactose intolerant can choose non-dairy sources. Pregnant women need 1000mg of calcium per day9. This can be reached with a few servings per day from the food list below. The minerals in vegetables sources, like spinach, can be made more available by cooking them with an acid such as vinegar or lemon juice. Try sautéing kale with apple cider vinegar and walnuts. Iodine needs increase by almost 50% during pregnancy. Iodine is used for thyroid hormone function and for the developing nervous system of the fetus. Women who have iodine deficiency, or are hypothyroid for other reasons, are at risk of slowing the brain development of their baby. Pregnant women need 220mcg of iodine and the American Thyroid Association suggests pregnant women supplement with 150mcg of iodine daily12. Seaweed and seafood are the major source of iodine, but because of the need to limit mercury exposure in pregnancy, relying on seafood may not be wise. Pregnant women should take a good quality prenatal multivitamin that includes natural folate/methylfolate and iron. Most pregnant women may need supplemental vitamin D based on blood tests. Supplements should remain supplemental to a healthy diet and if the diet includes fruits and vegetables at every meal, most nutritional needs should be met. Some supplements and herbs can also be useful to manage some of the symptoms of pregnancy, such as morning sickness. Ginger and vitamin B6 both have been studied and found helpful for nausea in some women14,15. While commonly used, some over the counter medications that have been recommended for nausea, like antihistamines, actually make it worse for some people16. Magnesium is helpful for constipation, and may reduce the risks of developing pre-eclampsia and other poor birth outcomes17. Herbals teas such as raspberry leaf, lemon balm, and chamomile have been traditionally used during pregnancy and are safe to consume, although mint can exacerbate heartburn, so use with care. Women should discuss all of the medications, supplements, and herbs with their midwife or obstetrician. While bland carbohydrates are commonly recommended for morning sickness and heartburn, studies have actually shown that protein helps more. Eat a low glycemic-load, healthy pregnancy diet to minimize the risks of feeling poorly. Eat regularly to keep blood sugars stable to minimize nausea. Make sure to consume enough water to stay hydrated and to keep bowels moving regularly. Exercise should be regular and not more vigorous that what the woman was used to before pregnancy. Long walks, prenatal yoga classes, and stretching are all excellent options for exercise while pregnant. Research has shown that all types of physical activity are safe in pregnancy except scuba diving, and extra care should be taken to avoid falling. Other healthy habits to help troublesome pregnancy symptoms include getting outside for fresh air, and ensuring good sleep also make a difference for both the pregnant woman and her baby. After delivery, the best diet is one that meets the nutritional needs of breastfeeding and helps the mother gradually return to her pre-pregnancy weight. Breastfeeding requires about 500 calories per day, so many women lose excess weight quickly. The nutritional needs of breast feeding require extra calcium and protein. Women also should be prepared for irregular meal patterns as they may be sleeping and awake at odd hours over the first few months as the baby's needs for nursing and sleeping evolve. New mothers shouldn't be focused on weight loss through calorie restriction while breastfeeding. Instead, they should continue the nutrient-dense diet recommended during pregnancy, and focus on increasing physical activity to accelerate a return to pre-pregnancy weight. ones that simply add calories without adding nutrition. Common bacteria pose a greater risk to pregnant women and their fetus, so extra precautions should be followed. Listeria, salmonella and toxoplasmosis are examples of bacterial infections that should be prevented in pregnancy. These infections can increase the risk of miscarriage, damage to fetal brain development and other organs. Infections also put the mother at risk with symptoms like diarrhea, dehydration, and fever. To minimize risk, make sure meats are fully cooked and stay away from raw or undercooked meat and seafood. No sushi during pregnancy! Deli meats, meat spreads, and smoked lox are also questionable and should be heated to steaming hot in order to kill any bacteria. Dairy products can also be a source of bacterial contamination. This is why pregnant women are encouraged to stay away from soft unpasteurized cheeses. The important part to remember is that pasteurizing (flash heating) foods kills bacteria; for example, pasteurized Brie would be fine. Vegetables and fruit aren't immune to bacterial contamination that occurs during the harvesting or preparation process. Toxoplasma is present in the soil and can contaminate vegetables. Always wash fruits and vegetables before eating them. Washing them with a water and white vinegar mixture can be more effective then a pure water wash.
Alcohol, in any amount, should be avoided. There is no known safe amount of intake, and drinking alcohol puts the fetus at risk for fetal alcohol spectrum disorder and associated developmental problems. Caffeine, whether from coffee, soda, or tea, has been associated with decreased birth weight4. Some of the man-made food additives are known to cause problems and should be avoided. For example, trans fats cross the maternal/fetal barrier, and are absorbed by fetus and may cause adverse effects on cellular membrane structure.6 Although limited research is available to quantify the risks of artificial sweeteners in pregnancy, they are able to cross the placenta into the fetal circulation and are typically found in nutrient-poor, processed foods that should be limited regardless. Illicit drugs, some over-the-counter (OTC), and many prescription drugs should also be avoided. If you are having trouble stopping taking illicit drugs or alcohol during pregnancy, talk to your midwife or obstetrician to get help specifically for pregnant women right away. There is help. Medications, either OTC or prescription, can be harmful to the fetus; double check with your health-care professional or look up the "Pregnancy Class" of the medication before taking it. 1. Mennitti, LV. et al. Type of fatty acids in maternal diets during pregnancy and/or lactation and metabolic consequences of the offspring. J Nutr Biochem. 2014 Oct 12. pii: S0955-2863(14)00203-4. doi: 10.1016/j.jnutbio.2014.10.001. PubMed PMID: 25459884. Artal R, O'Toole M. "Guidelines of the American College of Obstetricians and Gynecologists for exercise during pregnancy and the postpartum period." Br J Sports Med. 2003 Feb;37(1):6-12; discussion 12. 2. OSU Linus Pauling Institute. Micronutrient Needs During Pregnancy and Lactation. 3. Dotterud, CK. et al. Probiotics in pregnant women to prevent allergic disease: a randomized, double-blind trial. Br J Dermatol. 2010 Sep;163(3):616-23. doi: 10.1111/j.1365-2133.2010.09889.x. Epub 2010 Jun 9. 4. Lassi, ZS, et al. Preconception care: caffeine, smoking, alcohol, drugs and other environmental chemical/radiation exposure. Reprod Health. 2014 Sep 26;11 Suppl 3:S6. doi: 10.1186/1742-4755-11-S3-S6. Epub 2014 Sep 26. 5. Natural Resources Defense Council. Sustainable Seafood Guide. 7. Cogswell, M.E., et al. (February 1995). Gestational Weight Gain Among Average-Weight and Overweight Women - What Is Excessive? American Journal of Obstetrics and Gynecology. 172(2 Pt. 1): 705–12. 11. Wilcken, B. et al. Geographical and ethnic variation of the 677C>T allele of 5,10 methylenetetrahydrofolate reductase (MTHFR): findings from over 7000 newborns from 16 areas world wide. J Med Genet. 2003;40(8):619-625. 12. Am J Clin Nutr. 2008 Mar;87(3):517-33. 16. Matthews, A. et al. Interventions for nausea and vomiting in early pregnancy. Cochrane Database Syst Rev. 2014 Mar 21;3:CD007575. doi: 10.1002/14651858.CD007575.pub3. Review. 17. Fejzo, MS. et al. Antihistamines and other prognostic factors for adverse outcome in hyperemesis gravidarum. Eur J Obstet Gynecol Reprod Biol. 2013 Sep;170(1):71-6. doi: 10.1016/j.ejogrb.2013.04.017. Epub 2013 Jun 7. 18. Makrides, M. et al. Magnesium supplementation in pregnancy. Cochrane Database Syst Rev. 2014 Apr 3;4:CD000937. doi: 10.1002/14651858.CD000937.pub2. Review. Please share your experience with eating a healthy diet during pregnancy, for example, how did you overcome challenges, what foods soothed and what foods aggravated your stomach, etc. Did you, or do you plan to start eating a healthy pregnancy diet before you conceive? How much weight did you gain during your pregnancy, and how did you lose it?